A head-and-shoulders full face portrait of a man wearing a bead necklace (given to him by Evans-Pritchard) with an overcoat hung as a backdrop. The man is identified as Dal, Evans-Pritchard's chief informant among the Ingessana. Manual Catalogues [typewritten, entitled "Ingassana"] - 7. Male type (front view). F.2. Note on print reverse ms pencil - "F2 Phy. Type. dal (my chief informant) necklace from me"
Morton, Chris. 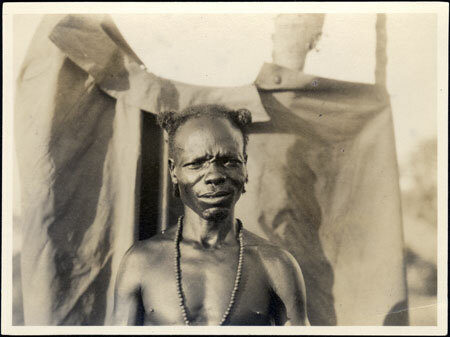 "Portrait of an Ingessana man" Southern Sudan Project (in development). 03 Jan. 2006. Pitt Rivers Museum. <http://southernsudan.prm.ox.ac.uk/details/1998.344.7.2/>.